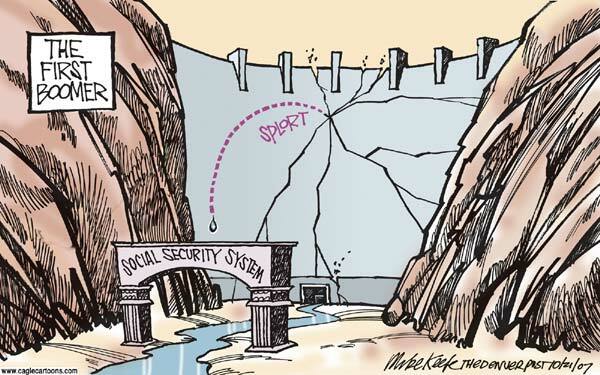 Last month, I posted “the cartoon argument” for Social Security reform. My main goal, as an American, is to achieve this important reform in the United States. And I’ve tried to bolster the argument by citing lots of hard data, including the fact that “funded” accounts already exist in nations such as Australia, Chile, Sweden, and the Netherlands. In this spirit, I wrote an article for the most recent issue of Cayman Financial Review, and I looked at the issue from a global perspective. I first explained that demographics are destiny. It is widely believe that aging populations and falling birth rates represent one of biggest global challenges for long-term economic stability. How can a nation prosper, after all, if there are more and more old people over time and fewer and fewer workers? Don’t these demographic changes put every-growing fiscal burdens on a shrinking workforce to support the elderly, leading to crippling tax burdens and/or enormous levels of debt? In most cases, there are no good answers to those questions. So it is quite likely that many nations will face serious economic and fiscal challenge… Here are some charts showing the age profile of the world’s population in both 1990 and 2100. As you can see, demographic changes are turning population pyramids into population cylinders. …virtually every industrialized nation is undergoing demographic changes that will produce some very painful fiscal consequences. But not all nations are in trouble. …there are jurisdictions, such as Singapore and Hong Kong that are in reasonably good shape even though their populations rank among the nations with the lowest levels of fertility and longest life expectancies. And other nations, including Sweden, Australia, Switzerland, and the Netherlands, have much smaller long-run challenges than other industrialized countries with similar demographic profiles. Why are these jurisdictions in stronger shape? Simply stated, they have personal retirement accounts. And there are now about 30 nations that have implemented this critical reform…though that number unfortunately is dwarfed by the number of countries that haven’t modernized their tax-and-transfer schemes. For advocates of funded pension systems, there is good news and bad news. The good news is that there has been a dramatic increase in jurisdictions that have adopted some form of private retirement system. …the bad news is that mandatory private retirement systems still only cover a small fraction of the world’s workers. The vast majority of workers with retirement plans are compelled to participate in pay-as-you-go government schemes. Unsurprisingly, I explain why personal retirement accounts are much better for the overall economy. Economists have been concerned about a triple-whammy caused by traditional tax-and-transfer retirement schemes. First, payroll taxes and other levies discourage labor supply during peak working years. Second, the promise of retirement benefits undermines a very significant incentive to save. Third, the provision of retirement benefits discourages labor supply once a worker reaches retirement age. …Systems based on private savings, by contrast, have very little economic downside. Workers are compelled to save and invest some portion of their income, but all of that money will be correctly seen as deferred compensation. …Perhaps equally important, second-pillar systems boost national savings, which means more funds available to finance productive private-sector investment. Though I bluntly admit that there will be a significant transition cost. The…common critique of mandatory retirement savings is that…if younger workers are allowed to shift their payroll taxes into personal accounts, policy makers would need to find lots of money over several decades (trillions of dollars in the American example) to fulfill promises made to existing retirees as well as workers that are too old to get much benefit from personal accounts. This critique is completely accurate. …But here’s the catch. While trillions of dollars are needed to finance the transition to a system of personal accounts, it’s also true that trillions of dollars are needed to bail out the current system. …The real question is figuring out the best way to climb out of that hole. From a long-term fiscal and economic perspective, personal accounts are the more attractive option. To elaborate, it’s better to somehow find $5 trillion over several decades to finance the shift to personal retirement accounts than it is to somehow find $30 trillion over a longer period of time to bail out the current system. For more information on personal accounts, you can click here for my video on the topic. And to learn about Obama’s supposed solution, watch (with horror) this video. P.P.S. While I’m a very strong advocate of personal retirement accounts (my Ph.D. dissertation was about Australia’s very good system), I’ll be the first to admit that it’s even more important to modernize Medicare and Medicaid. Our recalcitrant politicians have been pushing to have “government” socialize retirement to the point that they seek to effectively confiscate private retirement accounts at the rate of .60 on the dollar saved (last time I read it) whereas, the remaining monies be transferred into “Guaranteed” Retirement Accounts (read: “GRA’s”) that will be mandatory and NOT be usable as tax write-offs like part of the current system is now. The GRA’s will only transfer at the max of fifty percent, upon the death of the holder, to heirs. – At least, that is what I remember of the previous proposal that was publicized. – This would be the effect of an inheritance tax as it is with any real property or “estates” of the deceased. The united states is running in the opposite direction on this issue. The current Social Security system was designed to be a huge scam from the very beginning. Even more, there has been NO MONIES in it for several decades at a minimum. Thanks to Lyndon Baines Johnson, the original independent Social Security Trust Fund was dissolved and the funds therein transferred into the General Fund. THAT is why there is no money in these non-existent “trust funds”! It is all hypothecated “I.O.U.’s”. Pretty tough to “reform” that which was originally intended to be a scam from the very beginning. As long as Social Security is run by politicians the average American’s retirement is in danger. I completely agree that those who have paid FICA during their working lives should expect Social Security and Medicare benefits based on their contributions. The transition to personal accounts should occur over a generation. In 30 years, newly retireds will begin receiving benefits at 76. At that point, people will be living longer and working longer. The demographics of a declining birth rate will be compensated by longer working lives. Mandatory personal savings accounts (which should allow for down payments on home purchase) will provide an additional retirement cushion. @Kay, If you watch this video of Dan’s, you’ll see that the libertarian proposal fulfills the existing promises to current seniors and older workers (who wouldn’t have enough time left in the workforce to benefit from personal accounts). That’s why there is a “transition” cost. Regarding a fix for Medicare, the average Medicare recipient receives $14,000 in benefits. Those funds could be used to purchase healthcare in the free market (a freer market than we have now). Regarding the fix for Medicaid, there are two components. First, there is insurance coverage for those that cannot afford it. The answer for that would be a cash payment of ~$3,000 to every adult citizen, to be used to buy into a healthcare program. If you only give support to those without income, you create a disincentive. If you give to all, you provide a replacement for the employer healthcare exclusion, that is far more equitable and economically efficient. Note that the $3,000 per adult citizen could be paid for with the elimination of the healthcare deduction, current spending on Medicaid and Disability for the poor, and Obamacare subsidies. Obviously, those receiving Medicare and Veteran support would have an offsetting $3,000 reduction in their benefits. Second, those with pre-existing conditions must be cared for at current support levels. However, once we have free market universal healthcare for a period of time, this group will decline in numbers, since there will be no new additions. You forgot that we have all contributed to Social Security all of our lives. These are earned benefits that we have paid for. These are not entitlements as politicians have renamed them to try to fool people. The government has stolen from this account and not paid it back. YOU are acting like the government is paying for this. They are not. They are paying for it with our money that we paid in. Stop trying to rob us of our money.